Innovative ground cover made entirely from 100% recycled tyres! Developed in the UK using 100% recycled materials, this innovative ground cover from Dunweedin' lasts for years, avoiding the cost and trouble of annual replacement - and adds fade resistant colour to your garden all year round whilst being highly effective at weed control! Ideal for Landscaping, Borders and Pathways. 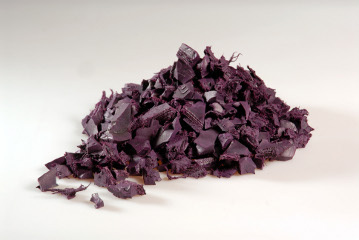 Available in Plum (pictured), Terracotta, Brown, Blue, Green, Granite and Black. Please note the colour required in the Order Notes field in PayPal, or via the contact us page, when placing your order. We recommend a depth of at least 4cm (1.5"). Covering to this depth requires approximately 15Kg per square meter. All Dunweedin' chippings are now produced to play grade, so are suitable surfacing for childrens' play areas. Please note that this product is sent direct from the manufacturer, and may take a little longer than normal to arrive. A signature is normally required for delivery, but we can arrange to leave your order in your driveway, at the back of the house, or wherever is convenient - just state you are willing for us to do so in the "Order Notes" field on checkout. Please do be aware however - while it is unlikely that anyone will be walking off with heavy sacks, we do so at your own risk. As this product is heavy and bulky - and thus very expensive to ship - we have to insist on a minimum order size. Customers near our supplier (see this page for areas/postcodes) benefit from greatly reduced shipping charges, and thus the minimum order is just 7 bags/70Kg. For our other customers, the minimum order is 20 bags/200Kg. Of course, if you are willing to pay the pallet delivery cost yourself (usually ~Â£40), we can ship any amount - please contact us if you wish to arrange this. You can also arrange to collect direct from Croydon yourself.